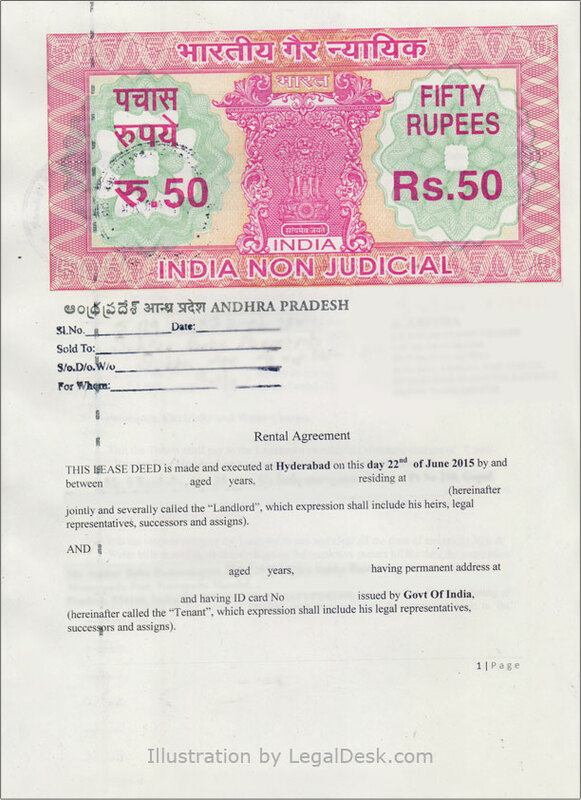 How to make rental agreement in AP? Home of the Nizams and laden heavy with the footprints of many cultures, Andhra Pradesh is nothing less than a royal affair. Blending modern and ancient nuances, most cities of Andhra Pradesh have become popular residential places, especially with the IT industry booming there. Cities like Vijayawada, Amaravati and the port of Visakhapatnam. The holy city of Tirupati is yet another popular real estate spot. If you have moved to Andhra Pradesh recently, we’re sure that you are in need for a place to rent or if you maybe someone planning to let out your property. We urge you to read this article on how to prepare rental agreements for Andhra Pradesh so that you are saved from future legal battles. The conventional way of preparing the rental agreement would involve the landlord and tenant discussing the clauses and other important points to include in a rental agreement. The lawyer then drafts it into a document and prints it on a Stamp paper of Govt. recommended value. Once the tenant and landlord place their signatures on the document in the presence of two witnesses, the document is almost ready. The final step involves registering the document at the local Sub-Registrar office. While the trend is shifting slowly to the use of online rental agreements, you must be keep in mind that all such agreements may not be legally up-to-date or expert verified. LegalDesk offers pre-drafted, ready to use, lawyer verified rental agreements that are safe and easy to use. Stamp Duty is a form of tax levied on documents to make it legally valid. This is often paid by purchasing Stamp Paper and printing the document on it. As of now, Telangana and Andhra Pradesh have the same stamp duty charges. Although e-Stamping was announced in the state of Andhra Pradesh, the traditional Stamp paper is still widely used as the former is not easily available. As of now, the states of Telangana and Andhra Pradesh use the same stamp paper. Registering a document with a Govt. authority is a method to prevent frauds and forgeries. It will also prove that the individuals mentioned in the document are indeed the ones who signed the document. Registering a document will also reveal facts about a property which would have otherwise remained hidden. In the state of Andhra, registration charges are 5% of annual rent+deposit. At the time of registration, the tenant and landlord may be expected to bring valid Govt. ID proofs, title of ownership (landlord) and passport size photos. Long Term Lease: This is a type of lease that is commonly used for residential purposes. The duration of such leases span years and often involve larges sums of money. Monthly rent payments are rarely seen in such arrangements as the rent for the whole term is paid upfront as lump sum. 11-Month Rental Agreement: This is the most typically used rental agreement and it spans a duration of 11 months only. At the end of term, both parties are free to chose whether they wish to renew the agreement or not. Rent, maintenance and other utility bills are paid monthly by the tenant. Commercial Leases: Commercial leases are signed exclusively for business purposes alone. They involve large sums of money and are signed for long periods of time. Formats for commercial leases vary according to the needs of the business and so there is never a standard format. Registration and Stamp duty are correctly executed for these leases as it involves a lot of clauses and money. Payments: The amounts for rent, monthly maintenance and security deposit must be clearly written out in the contract to avoid future confusion. Landlords are also free to describe a certain time frame within which the rent should be paid each month. Late payment penalty: Landlords can impose a fine on the tenant if the payment for rent is delayed. The nature of the penalty shall be described in the rental agreement. Lock-in period: Lock-in period refers to the minimum duration for which neither party is free to terminate the contract. This is a precautionary measure to avoid losses to both parties. Consequences of overstay: Should the tenant continue to occupy the premises even after the term of lease is up, the landlord can impose a penalty on the tenant. The details of the penalty shall be mentioned clearly in the contract. Food habits: Should the landlord wish to not entertain certain food habits within his property like consumption of non-veg, alcohol or drugs, he shall explicitly mention that in the contract. Pets: If the landlord does not wish to have animals in his property, he/she shall spell that out in the contract. Authenticity of the owner: There are cases where tenants/caretakers posed as landlords and pocketed the rent. To avoid that always ask the person claiming to be the landlord to provide bills/ documents to prove it. Receipts: Always ask your landlord for receipts of rent, maintenance, security deposit or any other payment you make. Registration: As discussed before, registering a document deters forgeries and frauds in the name of the property/ individuals involved. An unregistered document therefore, will only be considered as collateral evidence by courts. Security deposit is typically a few months worth of rent collected from the tenant by the landlord as precaution. This is a refundable amount and is returned to the tenant at the time of vacating barring valid deductions. In Andhra Pradesh, 2-3 months worth of rent is taken as security deposit. Also considered as the booking amount, token advance is a small amount of money paid by the tenant to the landlord to block the property for themselves. Once the token advance is paid, the landlord is expected to take the property off the market. Open our pre-drafted, lawyer verified, ready to use online rental agreement by clicking the button below. Fill in details of landlord, tenant and customize the document as per your need. You can either print the soft copy or opt to let us print it on Stamp paper and deliver it to an address of your choice. There are 0 comments on "Rental Agreements For Andhra Pradesh".